Tech Support Self Help - How do I request an event to be displayed on the Florida Tech Homepage? For an event to be displayed in the Florida Tech Homepage, the event must be a Featured Event. The process for request for an event to be considered a featured event is determined by an event being on-campus or off-campus (and can be requested during the event Submission process). Note: Featured Events are subject to approval. 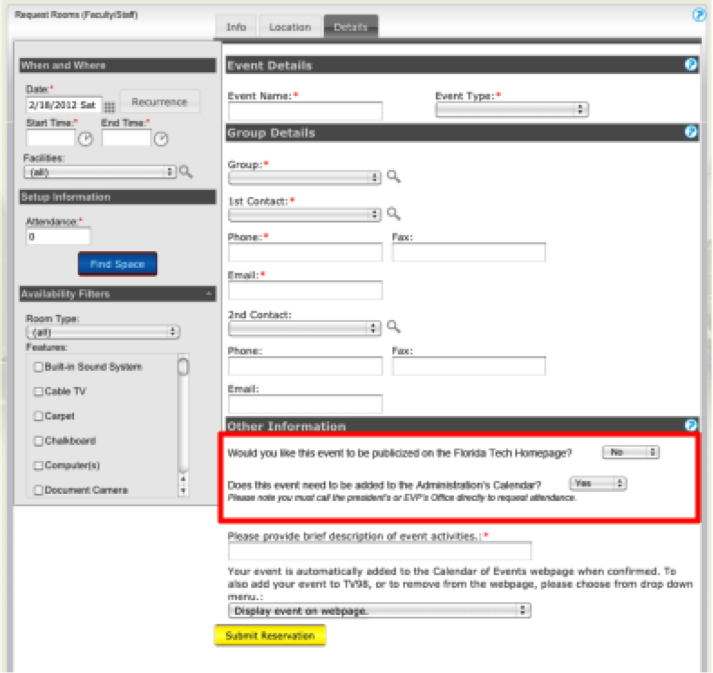 Complete the intial steps of the "Submit an Event Process"
Select YES to the question: "Would you like this event to be publicized on the Florida Tech Homepage?" on the EMS Reservation Form. Choose Featured Events as one of the calendars you wish to promote your event on.